Coffee, vanilla, and pistachio butter creams, rum, brandy, and orange ganaches, dark chocolate coffee praline, puffed rice and hazelnuts. 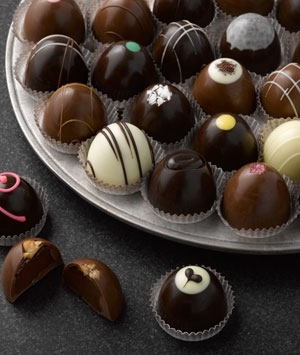 Leonidas Chocolates – From the County We Can Thank—and Praise—for Chocolate! Today, just as in the past, Belgian chocolate remains the gourmet standard by which all other chocolate confections are measured. Even the chocolate-savvy Swiss imported the basic recipe from Belgian and French chocolatiers. 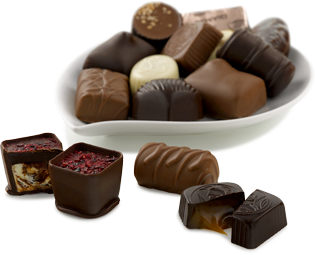 On that note, this month we bring you chocolates from Leonidas, probably the most famous gourmet chocolatier in Belgium. Despite their popularity abroad, Leonidas chocolates are difficult to find in the U.S. Crafted in creams, ganaches and pralines, Leonidas’ traditional individual chocolates have been made by chocolate artisans in Belgium for almost 100 years. With chocolate treats this good, you'll taste why the demand has been so high during the last century. Your precious supply from the Gourmet Chocolate of the Month Club will likely dwindle faster than you can say “Leonidas”! Talk about conundrum! Leonidas chocolates were created in the U.S., yet few in the States have ever even heard of them, much less experienced their lucious delights. Today, the name Leonidas represents the quintessential Belgian chocolate, not just to the Belgians, but also to chocolate fans worldwide. How did this gourmet powerhouse get started? Like most of our favorite chocolatiers, it was born out of passion for chocolate making, though Leonidas is a bit unique in that love of chocolate was not the only thing that helped establish its reputation. It began with the founder's love for a beautiful young Belgian woman…she helped secure his place in that chocolate confectioners’ treasure trove we know as Belgium. In the early 1900s, one Leonidas Kestekides left his home of Constantinople, living for a time in Greece before moving to Italy where he became a wine merchant. Times were trying in the region during those days so Leonidas next stop was New York where he began working as a confectioner. The young confectioner, Leonidas Kestekides, then attended the 1910 World’s Fair in Brussels, where, on his first visit to Belgium, he was lauded and applauded for his quality chocolate products. In 1913 he returned to Belgium as a member of the Greek delegation from the United States with an enhanced variety of chocolate delicacies and showcased them at the World’s Fair in Ghent. His efforts were rewarded—he earned the bronze medal for his chocolate confectionary and the coveted gold medal for his patisserie. That was quite a coup for an American in a land famous for chocolates and patisseries. As if winning great professional recognition weren’t enough, this charmed soul had also fallen in love with a beautiful young girl from Brussels whom he later married. Not surprisingly, Leonidas decided to settle permanently in Belgium. The two were divorced some years later, but by that time, Leonidas had fallen in love with Brussels and decided to remain there and open his first confectionery shop. His recipes were a hit and his fame spread. He opened tearooms in Ghent, Blankenberge, Brussels, and ultimately across Europe. In 1935, Leonidas' nephew Basile Kestekides took up the Leonidas torch. He incorporated a new company logo illustrating an effigy of the king of Sparta, also named Leonidas, in honor of his uncle. In his 'laboratoire' on Marché Aux Grains in Brussels, Basile created a whole range of new chocolates, including the well-known “Manon of Leonidas.” This master-confectioner also had an ingenious business and marketing mind. In 1936, he implemented a revolutionarily new concept, selling his freshly-made chocolates from the open window of his first shop on Boulevard Anspach. The practice of an open shop window where goods are displayed allowing passers by not only to see the merchandise but to buy them as well was, at the time, highly uncommon. This shop layout, at first glance seemed odd but it also was inviting and its appeal to the general public helped garner immediate success. This led to a series of other companies emulating the confectionary-in-the-window style across Belgium and eventually across Europe. As the founder of this fine chocolate company, Leonidas dreamt of making his Belgian chocolates available to everyone without ever lowering standards. Thankfully, the dream has been perpetuated by his successors. An integral part of Leonidas' success has been their innovation and willingness to keep the business a family-run endeavor. The third family member from the Kestekides family to join the enterprise in Belgium was Alexandros Kestekidis. Upon his arrival in 1940, he and Basile worked together developing various new flavors using pralines and alternative chocolate blends. His 58-year long tenure with the company appears to have been the longest among the family members (Basile's was about 35 years) as he continued to take an active role in the company development and flavor innovations until the end of his chairmanship in 1998. In 1970, other members of the family entered the scene; Yanni Kesdekoglu headed the company until 1985. In 1985, his daughter, Maria Kesdekoglu took over, and was joined in 1992 by her cousin, Vassiliki Kestekidou, who became President of the Board of Directors in 2003. Leonidas’ expansion has been seamless as the company remains vigilantly committed to continuing its guarantee of freshness and quality in the products it sells. They opened two new factories in 1983 and 1993 in order to satisfy the demand from its loyal and ever-increasing clientele. In 2000, Leonidas bought the company that produces the Deva brand products in Slovakia, expanding even further into Eastern Europe and beyond. Today, Leonidas chocolates are sold in 1,700 sales outlets, from Paris to Rome, from Sydney to Tokyo, from Brussels to New York. Leonidas Wins Hands Down – Or Should We Say Hands Up? In response to the question "What is your favorite chocolate?" most Belgian consumers said, Leonidas. It’s still the undisputed No. 1 Belgian chocolate. This was the outcome of the well-publicized "National Brands Competition 2004," organized by the LDV advertising agency and its partners. The basis for the competition was very simple: a list of the leading brands in each sector, from cars to washing powders to chocolates was drawn up. A panel of consumers (25,252 as it happens) was then asked to express their likes and dislikes, choosing their preferred brand in each category. In the "Chocolates" category, there was only one winner—the chocolates we bring members this month. Fifty-two percent of consumers chose Leonidas as the most popular chocolate in Belgium. The National Brands Competition is organized every year over the Internet and attracts an ever younger section of consumers who clearly love Leonidas chocolates, just as their elders do. For the first competition, held in 2003, Leonidas also won the "Chocolates" category in the National Brands Competition. Air-freighted straight from Brussels and quite fresh, your box of assorted chocolates is comprised of fresh butter creams, cream liquors, caramels, ganaches and pralines. It will include a mix of dark and milk chocolate varieties, very likely a few white chocolates, and some selections from the following intriguing list of flavors. While we cannot ensure that each box shipped will contain all of these flavors, each shipment sent to our members is sure to provide a palate-pleasing assortment of some of the finest Belgian chocolate in the world! Manon — Coffee butter cream and praline--available in dark, milk and white chocolate. Alexander le Grande — LEONIDAS' finest caramel concealed within either dark or milk chocolate. Europe — A rum ganache unlike any other--available in dark and milk chocolate.